MOLL -A Chart of ye EAST-INDIES, With the Coast of Persia, China also the Philipina, Moluca and Sunda Islands &c.
MOLL, H. - A Chart of ye EAST-INDIES, With the Coast of Persia, China also the Philipina, Moluca and Sunda Islands &c.
A Chart of ye EAST-INDIES, With the Coast of Persia, China also the Philipina, Moluca and Sunda Islands &c. - MOLL, H.
Title : A Chart of ye EAST-INDIES, With the Coast of Persia, China also the Philipina, Moluca and Sunda Islands &c.. Size : 11.0 x 14.0 inches. / 28.0 x 35.5 cm. 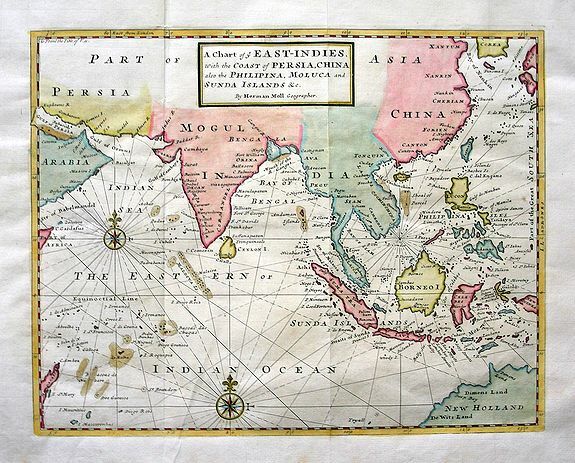 Description :Very decorative chart of the Indian Ocean. The map extends until Saudia Arabia and Madagascar in the West, and Australia, New Guinea, and Japan in the East. Shows a part of Korea. Includes the Philippines, Indonesia, Taiwan, the Maledives, Comores, Seychelles, and numerous other small islands. Superbly detailed chart with many place names along the coasts, but limited detail inland! Shows islands, reefs, and bays. Decorated with two compass roses and a simple title cartouche. Rhumb lines extending throughout the map. Condition : Excellent dark and clear impression printed on hand-laid paper. Only light uneven toning and a couple of tiny spots. Wide margins with light toning. Two vertical folds, one with light creasing to the bottom. One small area of paper thinning. In very good and decorative condition.